I have been constantly thinking and feeling that my grip is not right or Perfect. Always tinkering with it. Never satisfied with it. I decided to watch the video below about the Grip again. Normally I place my left hand on the club first and then after I place my right hand on the golf club. However, Shawn demonstrates how he places his right hand on the club first and then slides his left hand thumb into the pocket of the right hand which forms a union of both hands. I decided to try Shawn's method and noticed right away that this Grip was different and felt much better than what I was feeling previously. Both arms are straighter and feel more in front of me. I use to have a some what of a flying elbow, but that has disappeared. My right arm is straighter. Wrists' hinging has improved. Before I felt like I needed to hinge the wrists sooner in my backswing. Not any more. Before if felt like my left arm wanted or needed to bow rather than just hinge naturally during the Backswing. Best of all I finally feel like my swing is connected correctly with a lot less strain and much more support and power. The major difference between my old right hand Grip placement and now is that my right hand is a little more under the golf club with the V of my right hand pointing more towards my right shoulder rather than pointing more towards my chin. The Vs of both hands now line up and point in the same direction. They hands seem to work together in harmony. I would recommend you try out Shawn's method and not worry about where the Vs are pointing. After reading Brandon Chamblee's book again, on the chapters about the grip, Hogan had his right hand V pointing towards his chin and Tiger Woods had both Vs of both hands pointing to the right. Now my right hand fingers have improved leverage against the trigger finger and my right hand has improved leverage against my left hand. The right hand adjustment was not much but it has made a big difference for me. Feels better to me also. Right hand for some reason a bit more under compared going from left to right. 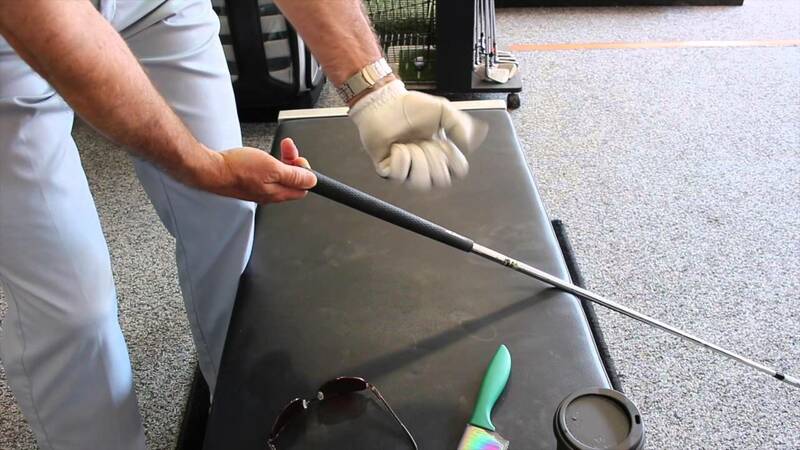 The video below shows you why it is important to grip the club with the correct hand to maintain your alignment and balance. Griping the club with my right hand first keeps me in balance and aligned. That is total rubbish, from the assumption that everyone's body is designed with a one sided offset over time. Balance is the ability to decipher where the body is in space through proprioception. (sp) Proprioception is greatly influenced buy the body's structural and muculature imbalance due to repeated movement patterns. here's a fairly recent article from Golf Digest from Bob Toski - a perspective of how he is teaching a swing concept using the hands..
Mr. Toski's concepts are based around clubhead feel - and are more related to the line of 'swing the clubhead' ..
this may not easily fit into WIG methodology which is more the swing the 'heavy weight' .. but it's worth noting how proprioception is viewed through the lens of hands/clubhead feel. in my mind - the sense of how and with what intention one connects to the tool being used very much influences a perception of balance..and how one achieves it. I'll offer this once. . and I'll say it directly.. I'll borrow this quote from Rumseld ..
let's aspire to allow conversations and exploration of alternative ideas to proceed or even flourish as opposed to immediately characterizing something as 'rubbish' if and when it doesn't agree with one's current understanding or perspective on a topic. and if one is to disagree - let us do so in a way that advances the conversation a bit more usefully or completely than what has transpired here recently on this thread..
Good to hear that Gary. Shawn's method really helpful to golfers. I'm glad you've improved a lot. Cheers! I think my right hand has been rotated to far over the shaft because I thought the trigger finger was to put leverage on the back of the club.